We as Christians really need to keep our souls on fire for JESUS. Having our souls on fire and staying on fire will help us get through each and every day when anything comes up. 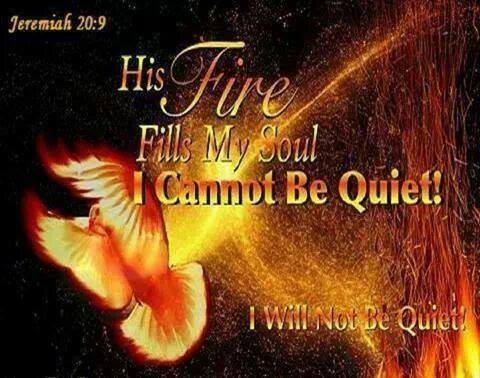 If we really have a soul on fire, we will have it 24/7. Every moment of our lives will be on fire. We need to have it deep in our souls to understand what’s the most important thing in our lives. I’m gonna preach it until we have it deep in our souls to understand what’s the most important thing in our lives. When you have a soul on Fire for JESUS and you keep it burning strong and powerful, you can command the enemy to take his hands of your family. Tell him that you can’t have my kids. You can’t have my family. You can’t have my joy. You can’t have my increase. You can’t have my Blessings. Set us on fire with a passion for JESUS and HIS Word. You can’t develop a passion for JESUS without knowing Him. You can’t know HIM without spending time with HIM. You can’t realize how awesome HE is without HIM changing you. You can’t love HIM without having a passion to know HIM more. You know how excited you get when telling people about JESUS. Keep that fire in your soul burning stronger and stronger every day. Keeping our souls on fire for JESUS will bring a passion for the lost. If we are so focused on Jesus, we will share HIS love and have a passion for the souls of men. We can’t hold it in anymore. Having a passion for souls will make us have soul-winning as the main business of our lives. What we do for JESUS will be exciting and it will keep the fire in our souls burning strong. We should be willing to change our plans for the sake of others. So we can reach out to them and to teach Bible studies.